GlobalGiving‘s mission is to help all organizations become more effective by providing access to money, information, and ideas. Before 2014 we used just six critera to define “good,” “better”, and “best.” If an organization exceeded the goals on all six, they were Superstars. If they met some goals, they were Leaders. The remaining 70% of organizations were permanent Partners – still no small feat. Leaders and Superstars were first in line for financial bonuses and appeared at the top of search results. But this dashboard wasn’t good enough. We kept tweaking it, looking for better ways to define learning. The past is just prologue. In 2015 organizations will earn points for everything they do to listen, act, and learn. This week I put together an interactive modeling tool to study how GlobalGiving could score organizational learning. When organizations do good stuff, they should earn points. If they earn enough points, they ought to become Leaders or Superstars. But how many points are enough to level up? That is a difficult question. We’d like to minimize disruption during the transition. That means getting the number of Superstars that would drop to Partner as close to zero as possible. It also means giving everybody advance warning and clear instructions on how to demonstrate their learning quickly, so that they don’t drop status as the model predicts. More instructions on what happens after launch are coming next week. This post is just the story of how we got to where we are, and a few lessons of what we’ve learned along the way. I predict that giving others this power (to predict and to set standards) will lead to a fairer set of rules for how learning is measured and rewards dolled out. It ain’t easy, but it is worthy of the effort. Two years later, many of these concepts were formally synthesized into an excellent report by Meghan Campbell, Mari Kurashi, et al: InfoPower: Under what conditions is information power? This question was explored through a collaborative research effort supported by the Omidyar Network, which resulted in the report. First, for information to empower, it needs to be embedded in a social and emotional context that inspires people to reinterpret that information and act on it. 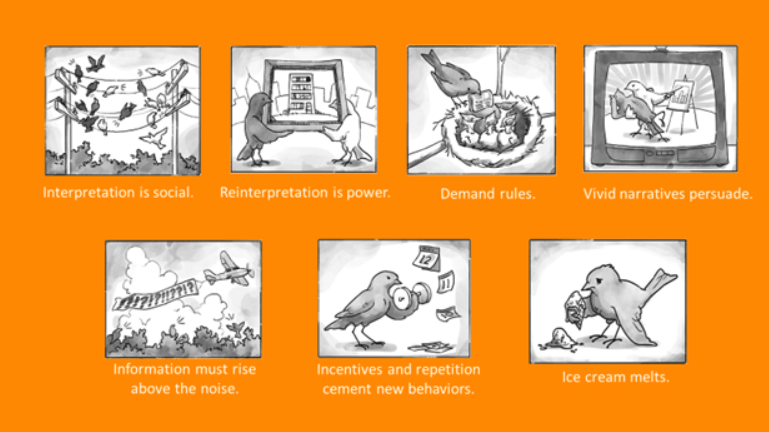 These are seven key principles that help explain when information does and doesn’t empower change. Both of these were important factors in designing GGrewards. It’s been a little hectic around here since this week, GG Rewards, the project I’ve been working on for about 2 years at GlobalGiving, officially launched to the world. Our goal is to help the thousands of nonprofits on the website grow not just their funding, but also the effectiveness of their programs and operations, via a framework of incentivized iterative learning. My colleague, friend, and co-nerd, Mark, has written a fantastic overview of the GG Rewards system that I’ve reblogged in its entirely below. As you’ll see, there’s some clear inherent “loopy-ness” to it. Marc and I have debated whether or not GG Rewards qualifies as a “strange loop”, and I’ll come back to that question soon. In the meantime: here’s Marc.